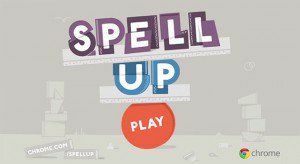 Spell Up is a cool voice-activated spelling game that is powered by Google. After choosing your level, you start spelling the words that you hear by telling it correctly using your microphone. Each time you correctly spell a world, the words will visually stack on top of each other to form a word tower, and you will try to build a higher stack at each time you play the game. If you can not hear a word, you can listen to it again, listen to the translation of the word in different languages, hear the pronunciation of the letters or hear the meaning of the word that you are spelling. With each correct spelling, the difficulty level will ramp up. With each level, you will be able to unlock different achievement and earn bonuses and coins to level up faster. If you fail at any of the challenges, your tower will crash down. You can view all your achievements by clicking the trophy icon in the top right corner. You can also download the app from Google Store to play on your smart phones. This game is so much fun to play in the classroom and a great way to practice spelling! Do give it a try with your students!